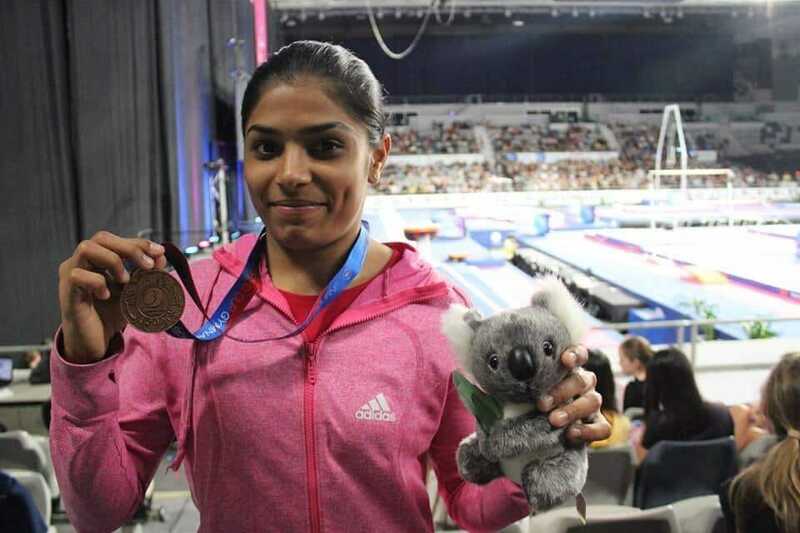 Hyderabad Girl Scripts History, Wins India’s First Gymnastics Medal in World Cup…! The Gymnastics World Cup 2018 in Melbourne will go down in history as India got its first ever bronze medal in the women’s vault event. The feat was achieved by Aruna Reddy, who finished after Slovenia’s Tjasa Kysslef and Australia’s Emily Whitehead, with a score of 13.649. A total of 16 countries were part of the World Cup series event this year. The 22-year old dedicated her stupendous win to her late father, B Narayana Reddy, who had been instrumental for his daughter’s entry into the field. Aruna with her Bronze medal. Source: Facebook. Realising that Aruna had the agility and build for a gymnast, Narayana had her enrolled at the Lal Bahadur Shastri stadium in Hyderabad at the age of five. “I owe everything to him, and if he had been alive and seen me on the podium today, he would have been so happy. He was there in my days of struggle, but couldn’t watch me win,” said an emotional Aruna to The Indian Express. The Hyderabadi lass, who is a former black belt and Karate trainer, had initially trained under the guidance of coaches Swarnalatha and Ravinder. Later, Swarnalatha’s husband Giriraj took over as Aruna’s mentor after realising her immense potential and was her instructor until his untimely death in 2008. Then, coach Brij Kishore took Aruna under his wing, and it is under his guidance that the budding gymnast blossomed and went on to clinch many medals at three National Games she had participated in, with the first one being in 2005. In 2014, Aruna had aroused some hope for Indian gymnasts when she secured the 14th position at the qualification round of Vault apparatus at the Commonwealth Games along with a ninth place finish at the Asian Games. Aruna came back to the fore when she had finished sixth in Vault during the 2017 Asian Championships. The young athlete is determined to give her finest performance in the upcoming international events. “The sad thing about this sport is that once you cross the age of 23-24, it becomes difficult to perform because the body doesn’t remain as flexible. A gymnast’s career is short. That’s why I want to make the most out of things before I turn 23,” she told Deccan Chronicle. Aruna is also part of the Indian gymnastics contingent for the 2018 Commonwealth Games which will be held in Gold Coast, Australia. We congratulate the young woman on her extraordinary win and wish her luck in all her future endeavours.